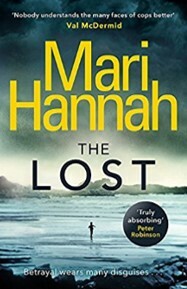 Award-winning Mari Hannah has begun a new series. Well known for her Kate Daniels series, she now introduces her fans to a fascinating duo: Detective Inspector David Stone and Detective Sergeant Frankie (or Frank but never Frances) Oliver. Hannah’s narrative starts when DI Stone becomes transferred from the Met (London’s Metropolitan Police) back to his native Northumberland, in the North East of England (where much of Hannah’s work is set). The pair are not an obvious mix: Frankie is impassioned, even a tad “bolshie” at times and used to getting her own way; Stone however holds back, is prepared to listen, but is certainly no pushover. When they are assigned the case of a missing child, their relationship becomes tested to the limit. It seems that when Alex Parker returns from a week’s holiday in Majorca with her sister, she’s expecting to be greeted at the airport by her much loved husband. Instead she finds the police waiting for her, together with the devastating news that her treasured ten-year-old son Dan is missing. The hunt is on to track him down, and so it leads Stone and Frankie along dark and unexpected paths. The author has a tight grip on the storyline, which switches direction (sometimes disconcertingly) and slips into channels that go far beyond their original brief, and as a novel, it establishes Stone and Frankie as a duo that are here stay.